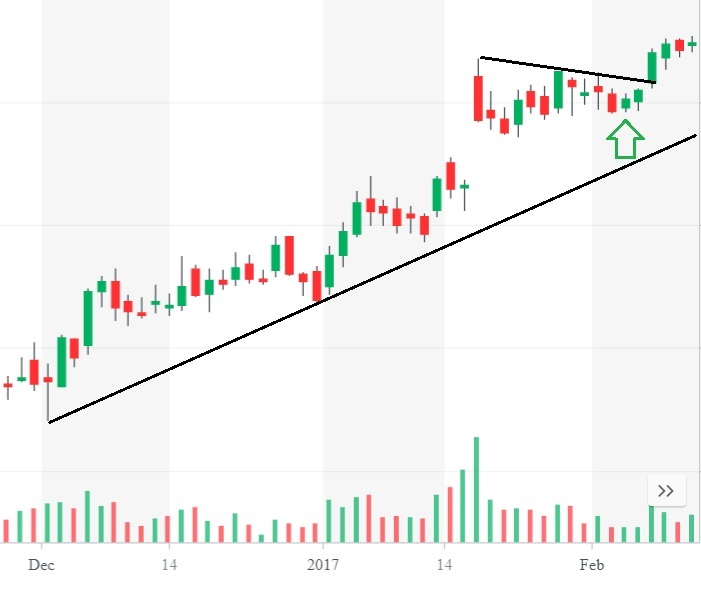 – important news in “stock in play” works as an additional signal for the entrance, which increases your advantage in the transaction, in such trades you can take a position with a large volume. You need to remember that “stocks in play” have their “expiry date”. If the stock is active for a week, then its movements may already be dirty, fuzzy. Interesting stocks should be searched constantly and regularly update list of trade securities. Certainly, you can concentrate on trading of companies’ stocks that are currently in the focus of attention (for example, Apple, Tesla), and using 1-2 trading models, to earn stable income on them, but on the market, you can find papers much better daily, their graphics will be less noisy, with more clear formations and an excellent risk-return ratio. For selection of stocks by filters, news, there are a lot of resources. Finviz, Yahoo finance, Russian-speaking Stock-watcher. There are resources where you can view prices on the postmarket for free, for example, nasdaq.com, thestockmarketwatch.com. SMB provides access to its SMB Scanner for relatively small amount of money. In trading, you do not need to spread on many stocks. It is necessary to select 1-3 securities per day and concentrate on one good deal, then on the next. You need to understand that trading includes set of tools and signals. Stable profitable trading consists of the right selection of stocks, news analysis, technical analysis, reading of feed, risk management. For successful trading it is not enough just single technical analysis. According to SMB Capital’s teachers neither indications, nor oscillators, candlesticks and graphic models do not show statistical advantage. Many trading models, that are described in books, at seminars seem good just on paper. On paper you can find confirmation for any model, but in practice, by the right edge of chart, situation differs. But there are common methods, that work and are similar for different markets and different timeframes. – if the price moves quickly from the level, then the level is likely to be withheld, and if the price consolidates for some time near the level, then the level can be broken. Pay attention to the quiet market near important levels. This may mean preparing for a breakthrough. In practice, unfortunately, everything is more complicated. There may be false breakdowns, the displacement of trading ranges, when the level breaks, but only in order to expand the range. It can be difficult to distinguish range offset or extension of the channel and the beginning of a new trend. Trading ranges seems easy just looking, again, on the history of prices. SMB Capital courses advised to look for trends and follow trends – these are the simplest and most reliable transactions. At the potential start point of the trend, you can first try a quick momentum-trade, the second entry point can be after the formation of the first pullback in the direction of the trend. In my experience, trading in the trend after the first pullback is the most reliable model. If there is news, then the second move after the pullback can be in the stock as big as the first one. Trading the model “after a pullback on the trend” is much safer than, for example, trying to make countertrend deals after the end of sharp vertical movements. There are two risks in such movements. The trend may continue against your position or the trend will go to the phase of the range, and your position will be inside the channel. If you are trading a scrap of a trend, then do not hurry and try to be the first. Wait for confirmation in the form of savings, retention of levels. Avoid countertrend transactions in the trend market. Also avoid trading in channels where there is no potential for price movement. At the beginning of your education it is better to concentrate attention on skills how to differ trend and channel, in the first place learn to make deals upon trend. At the seminar as example of technical analysis tools they teach to use the simplest things. Net graph, horizontal levels, trend lines, volume histogram. But there are subtleties in their use. The technical analysis begins with the senior timeframes, with weekly, daily charts. Important horizontal levels and trend lines are transferred from the older timeframes to the younger ones. These senior, important levels are used inside the day. Inside the day, are used charts for 1 minute, 5 minutes, 15 minutes, and the timeframe changes within a day. This is an important point, which we will discuss in details below. Important levels of senior timeframes are high, places from which strong movements have started, borders of gaps. On the daily charts, we can see at what volume they have risen or fallen. How intense the growth and fall were. Above or below the level, the day closes. The opening points, closing of relatively strong levels are very important. A good signal is if the price moves from the level at a higher volume. In the example, we do not see too high volume, perhaps because of lunch time. It can be seen that the price does not reach 170. Levels should be considered as ranges, you need to observe how the price behaves near the level. By the way, in this example you can see how many times you can go into the stock if you trade it on a trend. 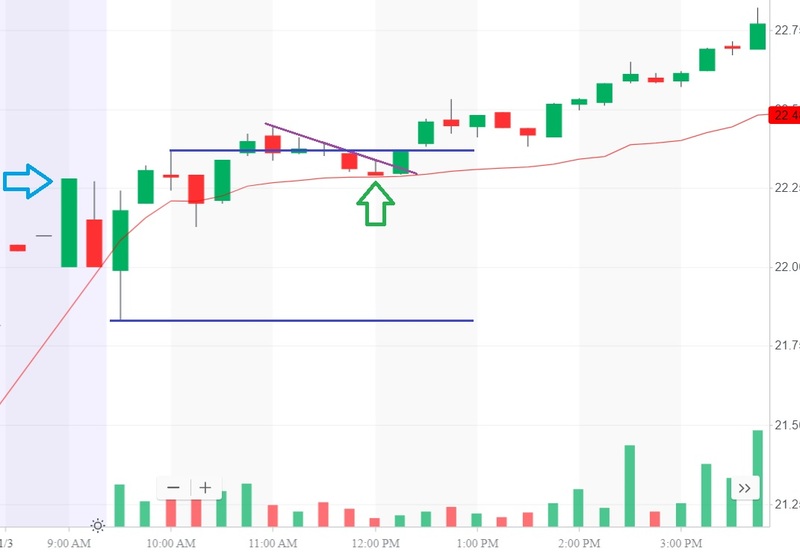 With the opening, you can make a momentum-trade lasting 5-10 minutes at the breakout of the low-end premarket level, then the entry point on the first pullback and then on the second pullback. Although the example of the AAPL chart is not a good one, it is too noisy and the stock is expensive. The most suitable place to enter the second pullback, I pointed with an oval. There is a pullback, then the uptrend breaks. After the breakup, consolidation is formed, where we enter. For a part of the position, we set the stop for consolidation, and for the part for the high the pullback. After the breakdown of the trend it is necessary to look for such consolidations. Now I want to convey the idea that it is important to trade the trend. Stocks in a trend give several entry points per day, especially during the reporting season. On the 15-minute chart there are several important signals. Because we watch the entry point closer to lunch time, then we are working with a 15-minute chart. The price is above the high of the premarket (blue arrow), near the upper level of the opening range (blue lines). Above the red line VWAP (Volume Weighted Average Price). This is the only indicator that was used at the seminar. The line of a small downward trend breaks (a purple line). An internal bar is formed (marked with a green arrow). Set at the next green bar on breakthrough of the upper level of the opening range. Stop under the pullback or slightly lower, at 22.2. We will return to the “inner bars” when we will talk about trading models. In general, the algorithm and model for trading are as follows. With the filters and news, we select stocks that we like on the daily and five-minute charts. The daily chart should have a power reserve to the nearest levels, and a five-minute chart should not be too noisy. We look at the daily chart and mark on it strong levels. We go to five-minute chart. We point on the five-minute levels from the daily chart. Further, we mark the levels of high / low on the postmarket on the previous day and the high / low levels of the premarket. 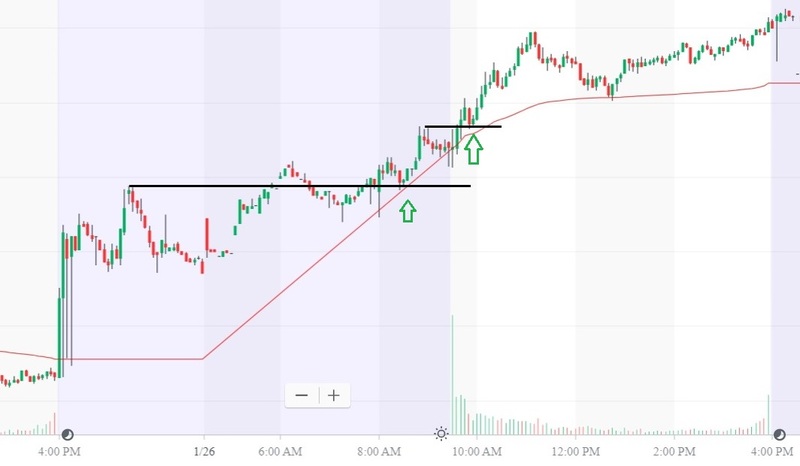 At the opening we put a minute chart, and during break through or hold of the post / premarket levels, you can try to make a quick momentum-trade. Hold the position for 5-15 minutes, and if the price goes against you, you need to close immediately. Consolidation can be even before the level of the opening range. We go on the penetration of this level, we put the stop for consolidation. In the first 30 minutes within the range there is a small trend down, it breaks (the first green arrow), further the price forms a small consolidation in the upper part of the range near the level. The course mentions that the middle of the range is also an important level. I.e. now the consolidation is formed in the upper half of the range, above this level. Buyers control the price. On the daily chart, the trend is up, good news, the price over VWAP, there is consolidation, under which you can put a short stop, the beginning of the day, i.e. you can still make a momentum-trade. We also look at how the market behaves as a whole, if the stock is stronger or weaker than the market, how leading stocks from the same sector behave, how ETF behaves at this industry. The entry point is marked by the second green arrow in the consolidation. We open a part of the position, stop for consolidation. 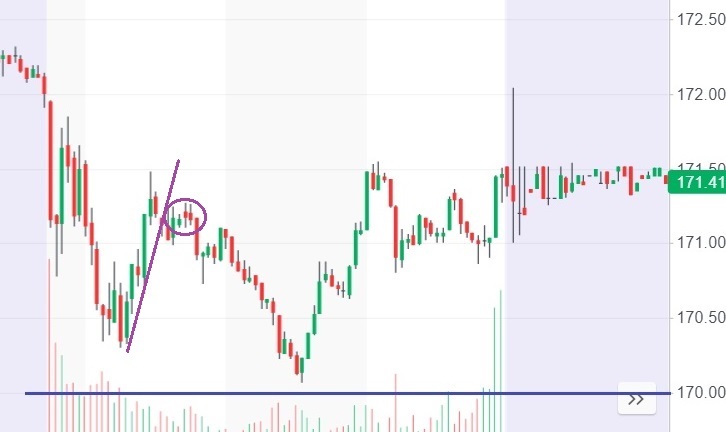 Another part opens at the breakdown of the upper boundary of the consolidation, counting on the momentum trade, a short stop under the upper level of the opening range, indicated by a purple line. Part of the position, calculated for the momentum-trade, we need to close, when the price has slowed down. We took a portion of the profits to close the risk. So now we can safely keep the remained part of the position counting on the big move. Even if we go out by stop, then on this security we will no longer receive a loss. There is a drop on the chart that looks like a pullback. Further, the trend breaks down, there is a narrow bar, the price is above the opening range, above VWAP, and when the price moves above the narrow bar, we go into. Because this is the middle of the day, then the volatility goes down, the risk that during the lunch the price will move in the range increases. Stop is obtained more because of the use of the 15-minute chart. That the risk in dollars for the position was adequate, the volume in the transactions at this time is decreased. The volume of transactions at lunchtime is 50% of the volume of morning deals. Also, a reduced volume should be traded on the premarket. The courses teach that when trading in the day, you need to use different timeframes. From 9:30 to 10:00 we trade on the one-minute chart, from 10:00 to 12:00 on the five-minute, from 12:00 to 14:00 on the 15-minute, and after 14:00 go again for 5 minute and trade on it before closing. Once again, I would like to say about the importance of the levels of the postmarket and premarket. Trading model is based on work with these levels. It works particularly well in the season of reports. Let’s analyze this model using the example of the INTC stock (Intel Corporation). After a good quarterly report on January 25, 2018, the stock increased in the postmarket and continued to grow at the premarket on January 26th. The profit grew more than expected, revenue increased, computer sales on the US market grew more than expected, due to the significant growth in the segment of data centers. On the postmarket, the price broke through the high for the year (i.e., we are above the strong level from the daily chart) and is at its maximum for the last 17 years. The model would be even stronger if the price on the pre-market did not go under the level of a postmarket high. It is better to leave the position in parts. If we get into a trend after a pullback, then a part can be closed when the price breaks through the previous high (we close a portion of the risk), and keep the rest of the position until the trend breaks. The presence of a pullback in the trend is a good signal. The stock on the volume rose, then began to decline without volume, makes a pullback. Then the downtrend breaks, and the price goes up again. This means that people are ready to buy more. But if after the growth there is no pullback, but there is a long horizontal consolidation (especially after 10:00), this could mean that sellers could take control of the stock. On January 24, came out news in the stock – analysts’ upgrade with a recommendation to buy. On the 25th, the stock rose, updated the high for the last 18 years. At premarket on the 26-th the price was traded near high. At the opening price does not fall and in the first 15 minutes comes out of the range, breaking through an important level. If after penetration there is no strong movement, then you must sell the entire position at once. Momentum can be with the breakdown of the trend, maybe in the daytime if there is a large volume and news. If in the momentum trade in the morning we took a good move, we can try to close half of the position, and then, after a pullback or consolidation, add to the position pending on a large trend movement. In conclusion of this section I would like to say about the estimation of transactions. Each transaction, before it is committed, is scored. The presence of the model – one point, the indices in your direction – one more, the key stocks of your sector are moving in your direction – another, strong level, there is potential for movement, there is an increased volume and, accordingly, increased volatility, large buyers / sellers on the feed, news, the right time of the day for the trade, the price over or under VWAP, ETF per sector, etc. The signals amplify or weaken the position. The amount of the transaction depends on this. In strong transactions, the volume and size of the risk is greater (in dollars per position), while in the weaker deals it is smaller. If we are in the position and the number of points increases, we can try to increase the volume, and if the number of points decreases, then the position should begin to decrease. You must prepare plan for the transaction before bidding. It should be clear from which strong level we get into (this price we need to expect), where there will be a stop, to what level the price can go up. It Is important to make up a plan before the bidding, because you are still in a calm condition. During the bidding, your psychological condition will be changed, and you will not always be able to adequately assess the situation. When you trade according to plan, your psychological condition is more stable. Tape reading is as important as technical analysis. In fact, the tape is the same chart, only with the smallest timeframe. On tape you can see in detail how the chart is being formed. Which one is stronger, how volumes are formed at a certain price level, how levels are kept or broken through, how aggressive buyers and sellers are. For a good deal, we need news, an understandable model on the chart that gives an entry point with a risk / profit ratio of at least 1: 3, and an entry confirmation on the tape. News, technical analysis and tape are related things. After the news (especially in the season of reports) large volumes appear, large players. The stock becomes less noisy, closer to trend. When large players appear, the activity of robots begins to decline, it becomes easier to read the tape and look for confirmation on it. On pre-market also, it is possible and it is necessary to look at tape, because on the pre-market, on the contrary, robots are disabled due to the low volume of trades. The tape should be watched at reversal points, on breakdowns, in places where the stock slows down its movement. On the tape you will see more quickly if this breakout was real or false. 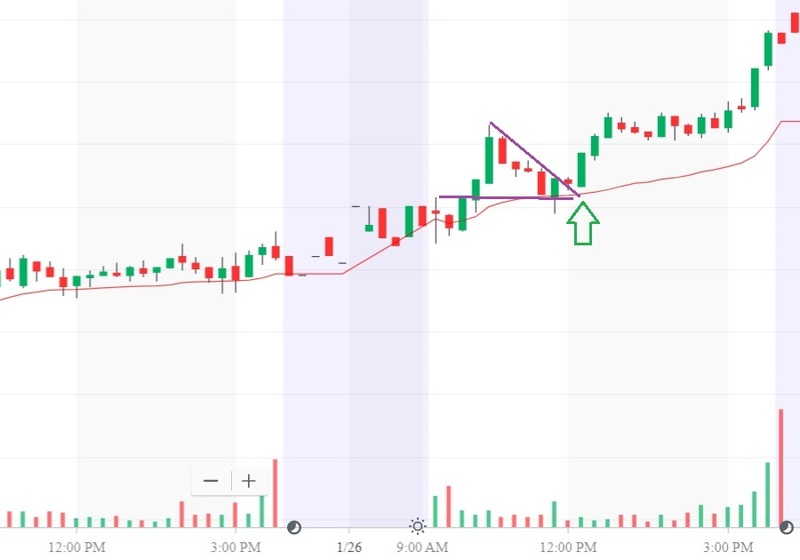 When committing momentum trades, when trading with the opening (at least the first 20 minutes from the beginning of the session), the tape is the main tool. 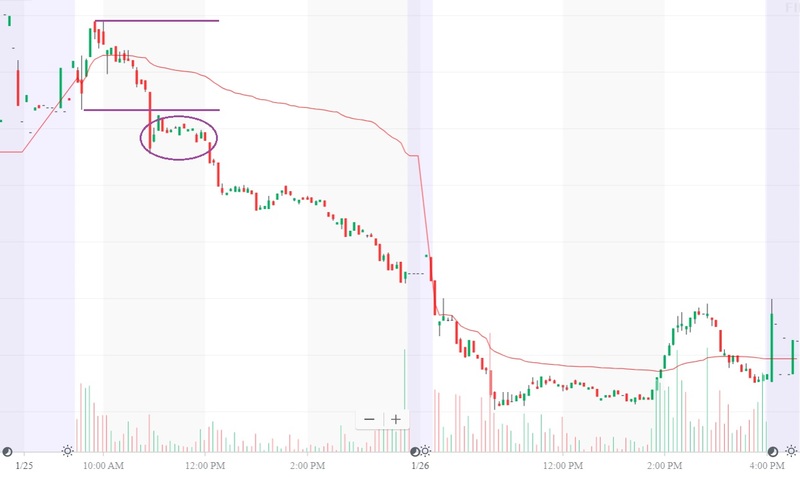 This may sound strange, but tape is easier to read when there is volume, and when it is fast, and not at lunchtime, when the stock does not move. At the opening, when rapid movements occur, the tape helps to control the risk. After a gap, tape also helps to understand who controls the situation in the stock. 1.Prints on bids, prints on asks. If you see prints on bid and then prices have downtrend – this is a sign of weakness. If prints pass through on ask and prices have uptrend, then this is a sign of strength. Constantly passing prints on the offer is a signal that someone really wants to buy this stock. You need to look at what the stock is doing after that. If you see a large number of prints on bid, and the bid is holding, the volume on it is updating, then this is a big buyer, we can buy too. Also, we look at the moments of analysis of such large buyers / sellers, after that the stock can begin a strong movement. Look, prints of what size were sorted out by major sellers / buyers. If we see a lot of deals on bids and offers on the tape, and then the price had downtrend, it means that they sold in this place, and the sellers won. By the tape, you can find out in which price ranges the stock is controlled by sellers and buyers. Whether stock goes above or below this range. As in the chart, we look at the levels that are held, and on the tape, we look at what prices it is held. If we see red prints, and then the price had uptrend, then this is a strong situation, the buyers have won. If, for example, red prints go, the price had downtrend, and then returns to the previous price, it is very good for buying. If on the tape we see a decrease in volumes on prints at some price, then there may be a shot. 2. Large print at a certain price. If you see a print with a large volume, then this is an institutional purchase. You need to remember these prices and observe what happens next at this price, if securities are traded higher or lower, in which direction the prints go. 3. Large print, and then a big print above. On the tape, you see a print with a large volume, then another print at higher prices. This shows that institutional players are willing to pay at higher prices. The stock can go higher. This signal is especially useful for determining the turning point. For example, the stock falls, and you see a big print, and then another big print at higher prices so far. 4. Changing speed of the tape. For example, the tape prints on the offer, then the speed of the tape increases, it prints on the offer faster. This can be a bull signal, someone wants to execute a large purchase order. Or, for example, you see slow prints on the offer, but when price decreases for these prices they instantly buy. This can be a signal of strength. If the tape slows down the speed of prints or you see that there is a small speed in the tape, then this may mean that the stock “is not in play” and you need to look for another tool for trading. 5. Volume at a certain price. Watch the prints to determine what volume was traded at a certain price. When you see an unusually large volume, traded for a certain price, then this price becomes an important intraday level. We trade from these levels. The more volume was traded at a certain price, the stronger the movement can be expected when the stock moves away from these prices. A trade – 25-30% of the daily loss limit. C trade – less than 10% of the loss limit. Risk is also regulated by using stops at different levels, opening and closing positions in parts. If your position is positive, then you can close the part, thereby closing the risk in the transaction, and then with the remaining risk-free position try to wait for a large trend movement. I hope this article was interesting for you and you found useful tools for yourself.